While writing the blog today at McDonalds and a discussion ensued with this man about my age after he asked if anyone had felt the earthquake. 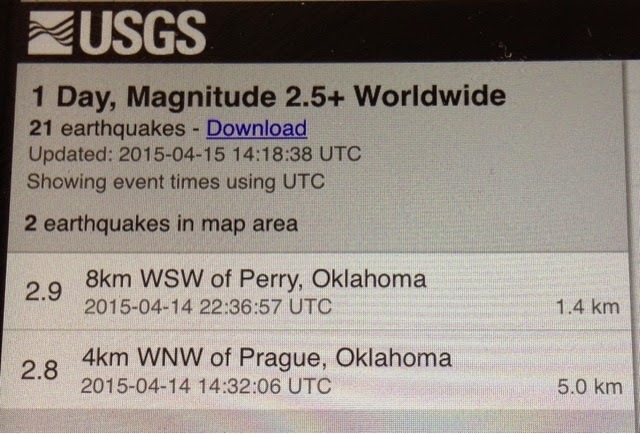 I looked up the USGS info on the web and found that there were 2 over 2.5 in our area yesterday. He said he had not felt them. Someone had texted him as they have seen it on the news. I commented that a 2.5 earthquake is low to feel at any distance from the site and you would have to be still. I bring the issue up as Oklahoma and possibly other states where fracking is used heavily are experiencing a exponentially higher rate of earthquakes that have resulted from Fracking. I feel that we as a nation can do so much more with renewable energy and save our natural resources and don't take risks like this unless there is no other recourse. Do your own research on the subject and look at the rate of population growth and rate of consuming natural resources and it is unsustainable at some point. Fracking to me is a slippery slope that is driven my money. Fracking gas isn't all for US consumption. My Prius travels this year was inspired by my gas guzzler Class B Campervan travels of last year. I wanted to see if it was viable to travel the earth and enjoy myself by living in and out of my Prius vs the gas guzzler and I have and I am so glad I did it. You can too and at the same time you save the environment and see our beautiful country and not leave a large carbon footprint. It is possible to do this with a family too. When I'm back home my Prius is my char of choice to visit my camp in VT and visit my son and family on the east coast. I can drive from my house in Massachusetts and drive to his house in Maryland some 440 miles on one tank of gas. I should have gotten a Prius a long time ago but reducing the carbon footprint and consuming natural resources can start anytime.